Where mountain and forests meet the Great Southern Ocean. Relax and unwind at your choice of quality accommodation in the region, choose from the many beautiful walks through pristine forests and exquisite beaches, Try your hand at fishing, sailing, boating, diving or stroll along the white, sandy beaches that epitomise Tasmania's Far South region. The touring route to get you easily around the region, quiet country roads wind their way through the valleys and along side the waterways taking you from one adventure to the next. Visitors often say they are stunned by the gorgeous scenery, not just because it's beautiful but because there is something different around every corner. 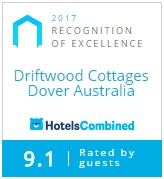 We value your feedback and would love to hear about your experiences at Driftwood and Tasmania's Huon and Far South. Please use our Tripadvisor link above to leave your review! Driftwood is an original member of Green Tourism, an initiative designed to assist tourism operators to assess and reduce their environmental impact. It is about improving the sustainability of the industry by recognising the environmental impact of tourist activities, and helping operators to reduce their energy use, water use and waste production.